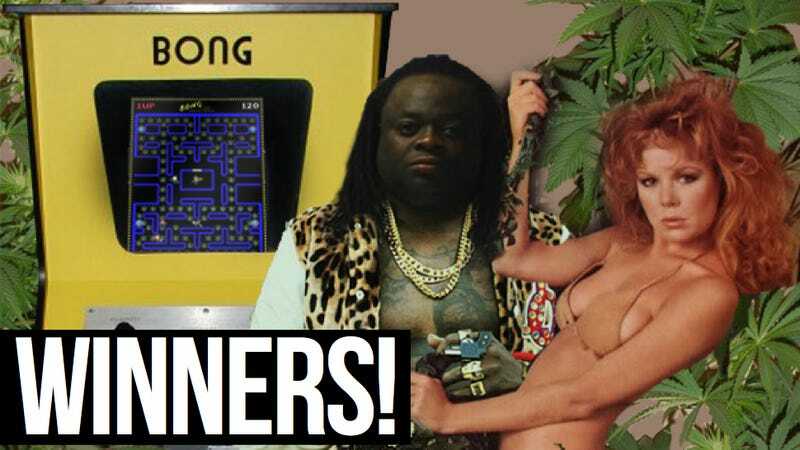 Last week, Luis Tyler beat all you ever saw, gettin' in trouble with the law with 55 pounds of marijuana packed into a Pac-Man cabinet. This was a grand time to introduce him to the Kotaku 'Shop Contest, and it resulted in a first! The first ever tag-team overall No. 1, thanks to all-stars Sciteach and uscg_pa! Sciteach came up with the base "BONG" cabinet image, while uscg_pa, working independently, developed the screenshot it uses. When the two realized what they had, they activated Wonder Twin Kotaku 'Shop Contest powers to come up with the winnah.